Do you think it’s time to repair, remove or upgrade your old, cracked, or stained grout? This article might be able to help. In this article, we will show you how to remove old grout and also open your eyes to the best grout removal tools to carry out the job efficiently. For you to find the easiest way to remove grout, the following grout removal tools are being discussed so you could make the right choice. Professional installers prefer oscillating power tool because it does not produce clouds of dust unlike the angle grinder or rotary tool. They are called oscillating tool because their blades oscillate, moving back and forth instead of rolling like the rotary tool or angle grinder. They are, however, not suitable for large-scale projects that involve the removal of grout. When you switch it on and place it between the tiles, it will begin to vibrate or oscillate thereby shaking the grout into dust. You can simply clean the dust with a vacuum cleaner before regrouting. Check the review of the recommended oscillating tool below. The DEWALT DWE315K oscillating tool is not only one of the best grout removal tools available on the market but also one of the best tools for scraping, sanding, cutting or removing a range of materials. 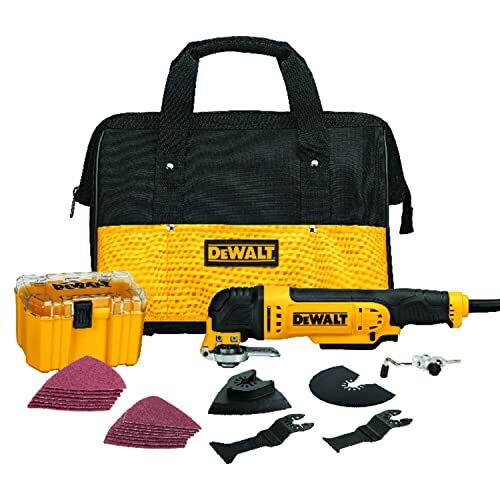 DEWALT DWE315K is one of the most effective tools to remove grout without damaging the tiles. It even comes with a LED lamp that helps brighten your work surface for a perfect and precise operation. With the amazing features present on the DEWALT DWE315K oscillating tool, you would readily agree that it is the best electric grout remover. If you are looking for the easiest way to remove grout and a lot of it, this is the best way to go. It does not spew grout dust throughout the room since its blade oscillates and do not spin like a grinder. The rotary tool is also an electric grout remover that is commonly used for small repairs or removing grout on a few tiles. They produce dust as they grind out the grout from the joint. The joint must, however, be large enough to contain the blade of the tool, which is usually not less than 1/8-inch. 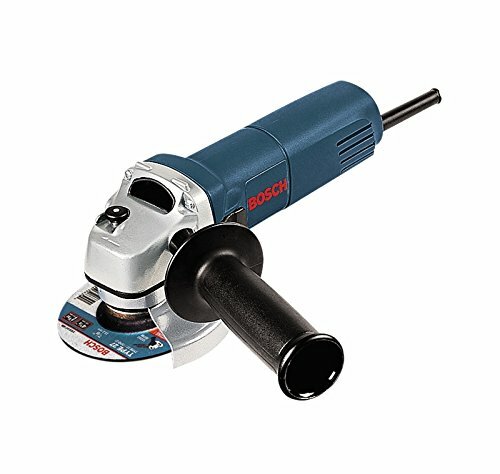 Check the recommended rotary tool review below. This high-performance rotary tool is arguably one of the best electric grout removal tools considering its price and overall quality. 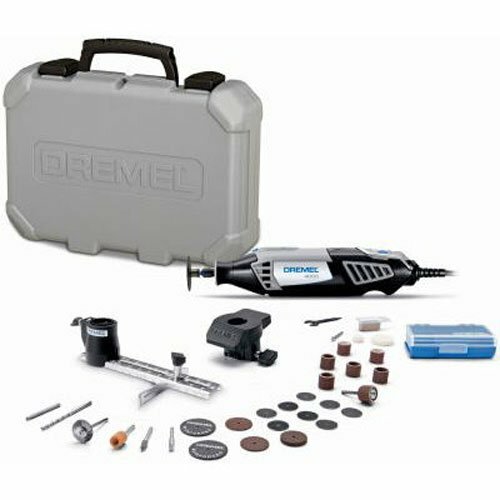 The Dremel 4000 boasts a great deal of versatility since it could be used for other applications like sanding, polishing, cutting, or grinding. You can control its speed from 5000 rpm to 35000 rpm and even use it to handle jobs like grooving, slotting, hollowing, shaping, and making tapered holes in woods, plastics, and soft metals. The Dremel 4000 is an amazing electric grout remover. 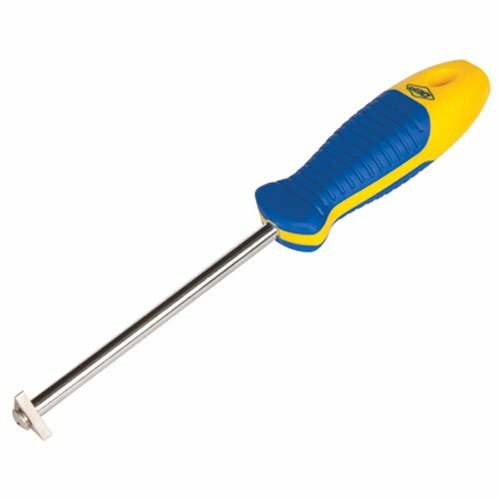 If you are looking for a high-quality tool at an affordable price to remove grout or tackle various other DIY applications, this tool is your best bet. The Grout Grabber is another effective instrument for removing grout. When you attach it onto a reciprocating saw and pull it along the grout lines, it will move back and forth to crush the grout. It works effectively on the floor or wall and comes with a little risk of damaging the tile. However, the blade of this tool is thin and may require the combination of several blades to remove all the grout. It also requires that you buy or have a reciprocating saw. If you already own a reciprocating saw, you should consider adding the Grout Grabber GG001 to your collection for a quick and accurate grout removal. This 6-inch Grout Rake features a curved cutting edge (2-inch blade) for optimum grout removing accuracy. It has coarse carbide grit that helps in the removal of all cement-based and epoxy grout types from 1/16 inch to 1/2 inch. You even can use this to make a relief cut that to remove a chipped or cracked tile. If you are looking for an efficient tool to remove grout without chipping the tiles, the Grout Grabber might be the best way to go. It can also be used when replacing tile grout. With the introduction of the angle grinder, you would agree that it is the best tool for removing grout on a large-scale project. It is the fastest and most efficient way of removing grouts across the length and breadth of a tiled area. 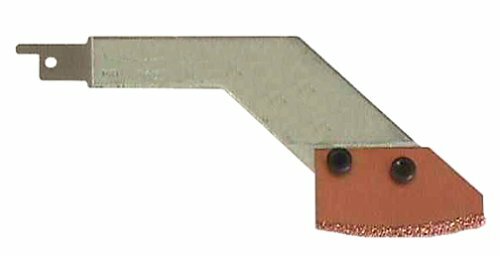 You can fit this tool with different kinds of cutting blades for various cutting and scraping applications. Just like the rotary tool, they are compatible with joints that are wider than 1/8-inch. It, however, produces a lot of noise and spews grout dust throughout the workspace, filling the area with excessive clouds of the dust. They should be handled with care while removing the grout since they can cause damage to the tiles. If you’re removing an epoxy grout, soak the area with bleach and water (2 cups of bleach to every 1 gallon of water) for about 30 -60 minutes. Apply this solution on the grout every 10 minutes and make sure you clean the solution before grinding the grout out with this tool. Using a grout saw is one of the best ways of removing grout from the tile. They are manual grout removal tools that provide extraordinary force for cleaning, stripping and removing old or cracked grout. The blade is replaceable and leverages on the user’s power for its applications. However, it can scratch the tiles if your hand slips. This is one of the preferred tools among professional tillers as it works perfectly for removing old or damaged grout. By simply using this tool, you will be impressed with its grout removing ability. The tool is handy and durable; you can even use it in the grout cleaning process. Store the tool properly after use to prevent corrosion and damages. Hand tools are the old-fashioned method of removing grout from tiles. To remove grout, you only have to place your hand tool’s tip or blade on the grout joint and apply pressure to cut or scrape out the grout. Hand tools are suitable for detailed work where the protection of the tiles is needed. They are not as fast as the electric grout removal and are mostly used for small grout repairs but unsuitable for handling a large-scale project. With this tool, you will not only remove grout but will also be able to reach tight corners and stubborn areas thereby complementing the work done by your oscillating tool. It offers a comfort grip with a durable tip that removes other materials like thinset, surface residue, caulking, and mortar. If you want to work on delicate edges, stubborn places, and tight corners that are difficult for other tools to work effectively, the QEP 10020 Grout Remover would be the best way to go. It will be a great addition to your tool collection. These are the oldest tools used for removing grout. They are those basic tools that will probably be the component of your first set of tools. They are handy and easy to use, with your basic skills and knowledge; you can use them to carry out a good job. However, these tools are not so accurate and fast to work with and also come with a higher risk of cracking the tile. Grouting is an essential part of flooring. It does not only fill the space between tiles but also strengthens the countertop, wall or floor by holding the tiles together while preventing possible cracking or chipping of the tile’s edges. When grout is intact, performing its tile locking duties, preventing leakages and giving walls and floors a sleek and finished appearance – nobody seems to notice them. But when grout fails, becomes old, cracked, dirty, stained or falls out that people begin to notice. Although having clean tiles and grout is important in maintaining a healthy and friendly environment, cleaning the grout can be such a difficult task. If your grout is old, cracked, or permanently stained, it might just be an indication for you to go for an upgrade and have it changed. Re-grouting or starting over with a new grout is not that difficult and will yield a big visual difference. However, you will have to remove your old grout before adding a fresh one, and this process can not be carried out efficiently without the right grout removal tools. There are two main types of grout removal tools: hand or manual grout removal tool and electric grout removal tool. Understanding the types and the properties of these tools are important in making the best tool choice for your grout removing project. The properties of these types of tools are discussed below. Just as their name implies, that depend on battery or electricity for power, to remove the grout. Most of these tools are ideal for large-scale projects and projects that need to be completed within a short period of time. They are more expensive and may be limited to some widths of the grout joints. Extra care must be taken when using these tools to avoid chipping the tiles. These grout removal tools are considered the best grout removal tool when it comes to protecting the tiles. Unlike their electric brothers, hand tools are cheaper and suitable for various widths of the grout joints. With the hand tools, grout removal is carried out rather slowly which makes them only suitable for small projects. Now that you have decided to remove your old or damaged grout, an accurate set of information and guidance is required to help you efficiently complete the project. While you can call on a pro to tackle the project, learning how to remove grout is very important since you will be saving yourself a lot of cash by tackling the project all by yourself. The following guidelines will show you in details how to remove grout safely and effectively. There are several tools you can use to remove grout. The ideal tool depends on your budget and how much grout you are removing. Once you inspect a work project and decide on the tool you want to use, you can proceed to the next stage. Using a power tool, fix the tool with the right blade for removing grout. Hold the power tool vertically or horizontally (according to the grout seams), switch it on and press the blade gently to the grout. Allow the tool to carry out its job; do not apply too much pressure on it. The blade should simply cut and crush out the grout. Angle the blade by bending the tool gently to crush out more grout. You have to work gently and patiently to avoid damaging the edges of your tile. Your arm can get tired while holding the tool for so long and this can affect the accuracy of your work. To avoid this, you rest your arm on your toolbox while you work. After you have removed the grout as much as you can with the power tool, use your screwdriver to scrape out the grout that the tool has loosened. If you still have some bits of grout that fail to comes out, use your utility knife to scrape them out. You can do this during the grout removal process to allow you see what you are doing clearly. After completing the grout removal the process, clean your work area with the vacuum cleaner. Removing your old or damaged grout is no longer difficult as it used to be. With the steps and best grout removal tools discussed above, the difficult process of removing the grout without damaging the tiles has now been made easier. Do you think it’s time to remove your old, stained, or cracked grout to carry out necessary the home improvement project of re-grouting your tiles? Do yourself a favor, get any of these tools and thank us later.